Mark left me a small gift from his last visit that I've had in the fridge for a while. It's Arcadia Ale's Cocoa Loco. Don't worry this is not some malt beverage with caffeine in it that causes college kids to lose control in fits of hysteria and perform unscrupulous acts forcing towns councils to ban alcohol and dancing. 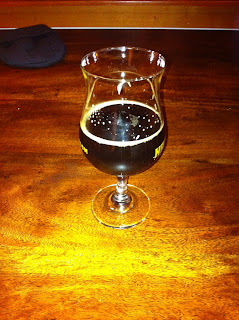 This is a milk stout with Cocao nibs, chocolate, and Molasses. There is coffee and molasses in the nose. There is an efervecsent pour with a head that evaporates and leaves a halo around the glass like a cola. Pitch black but not motor oil thick. There is a bitteness from the chocolate malt and hops, and a creaminess from the lactose and malt. 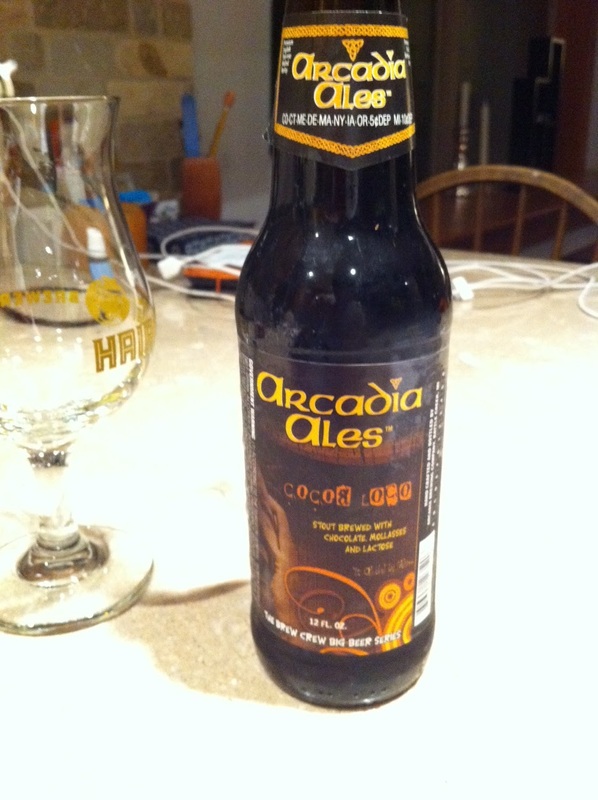 It has a nice dark malty flavor but somewhat thin body for a stout. It's drinkable but still strong flavored. The bitterness sits squarely on the sides of the tongue but doesn't build into a displeasing aftertaste. The lactose creates a creamy slightly milk flavored aftertaste that helps counter the bitter nicely and refresh your tongue for the next sip. Kind of cleansing your pallet for you. How considerate! A lovely sessionable 7% abv chocolate stout. What the hell an I saying? It's not some coffee bomb or motor oil with layers of flavors. I don't really get the molasses but the chocolate and lactose are readily apparent. If you're a little hesitant about stouts this is a great intro beer. 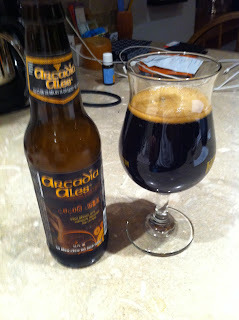 Lots of pleasing flavors and all the components of a good stout but it doesn't let you down hard or come off too sweet. Pros: Pleasant, drinkable, milk stout that's a great dessert beer. Cons: In it's lack of offense and controversialness, is also a lack of complexity. Verdict: A pleasing unoffensive stout that's a great session stout.